Here’s a question you’ve probably never asked yourself: What if your gaming PC looked less like a traditional computer and more like a beer cooler? 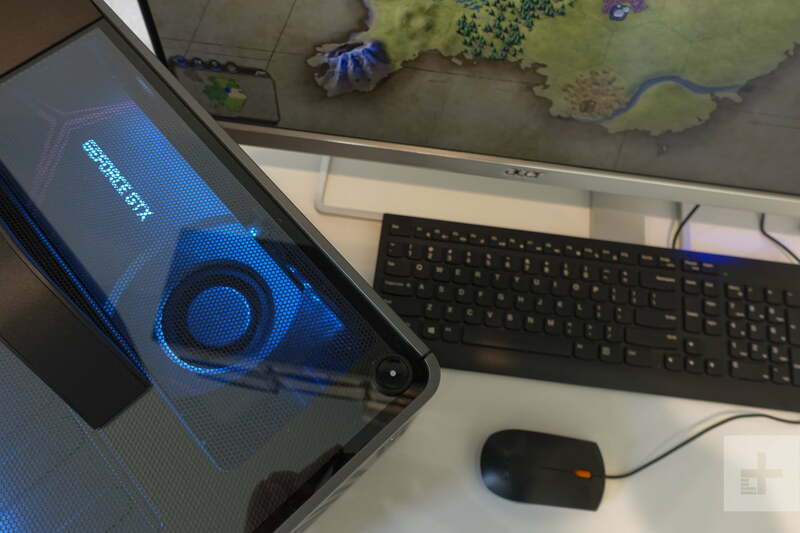 Lenovo’s latest compact gaming PC, the Legion C730 Cube, is as close to that as we may ever see. The C730 Cube not only looks the part, but it also keeps its internals cooled ships with its own six-pack in the form of Intel’s hexa-core processor. Alongside that capable processor, you get the Nvidia GeForce GTX 1060 for graphics — as well as a unique carry handle for easy transportation. Starting at $1,300, the C730 Cube represents Lenovo’s unique approach on balancing performance, price, and portability, but is this Coleman-inspired gaming PC the right tool for your next gaming battle? Unlike its rivals, Lenovo took a more muted approach in designing the Legion C730, and that’s not necessarily a bad thing. Unless you live, breathe, and play PC games 24-7, the C730 will fit in no matter where you set it up in your home. It’s minimalist matte black finish — which Lenovo calls iron gray — helps it transition between a work horse in your home office, a home theater PC in your living room, and a powerful VR-capable gaming rig. Competitors in the category, like the ASUS ROG Huracan and MSI Trident 3, come with more aggressive, angular designs and red accents that do little to conceal their gaming roots. Though these desktops may immediately catch your eye, they’ll start to feel out of place when used in a more grown up home office space. But the C730’s more grown-up vibes come with its own costs — the system isn’t the most compact. While rival systems occupy as little desk real estate as possible — ASUS’s ROG Huracan G21 has a smaller footprint at 5.11 x 14.66 x 14.41 — Lenovo designed the C730 around portability. At 9.09 x 13.07 x 9.53, the C730 takes up more desk real estate, but the carry handle makes it easier to move. To maximize the use of available space, the C730 comes densely packed, contributing to the unit’s heft. Weighing just shy of 20 pounds, the C730 is within range of other compact gaming desktops. Like other gaming desktops, you won’t find any shortage of ports. At that weight, it’s not something you’ll want to carry everywhere, but if you need to move it, the top carry handle helps. And, if you’re concerned that long gaming sessions can lead to a sedentary lifestyle, just take a break and lift and carry the C730 between rooms for some instant strength training. The outside surfaces are mostly constructed of a durable plastic, but there’s an internal metal cage to keep things reinforced. The two removable plastic side panels are also lined with metal sheets. Up top, you’ll find a carry handle and a clear plastic window lets you quickly identify the C730’s gaming heritage — when the unit is powered on, full RGB lighting illuminates the top of the unit, and the clear window gives you a peak at the graphics card — our review unit is powered by Nvidia’s GPU and shows off the GeForce GTX branding. RGB lighting, CPU overclocking, and warranty support are all handled through the bundled Lenovo Vantage app. Like other compact gaming desktops, you won’t find any shortage of ports, which are distributed between the front and the rear, and there’s a removable rubber strip on the back for cable management. In total, you’ll find eight USB ports (two USB 3.0, four USB 3.1, and two USB 2.0), an Ethernet connector, headphone jack, mic input, audio output, DVI port, three DisplayPort connectors, and single HDMI port. Dolby Atmos is also supported, for an immersive audio experience. While there are ample USB ports, the C730 doesn’t come with USB-C or Thunderbolt 3 support. Including these ports would have made the rig more future-proof and allow users to connect an external GPU. Both MSI and ASUS included a USB-C port on their compact gaming desktops, allowing gamers to connect newer drives or monitors to their systems. Wireless connectivity is supported by 802.11ac Wi-Fi with 2×2 MIMO and Bluetooth 4.2. The only thing that connects the C730 to your home outlet is a medium length power cable. All configurations of the C730 also ship with a wired keyboard and optical mouse, though you dedicated gamers may want to upgrade to a mechanical keyboard. The USB keyboard is responsive, but doesn’t come with any backlighting effects. The keys are responsible, have good travel, and key caps come with a bottom curve similar to laptop keyboards on Lenovo’s IdeaPad and ThinkPad lines. Our biggest complaint with the keyboard is that Lenovo made it a bit more compact by squeezing in the traditional two-row, three-column area that’s home to the Insert, Page Up, Page Down, Home, End, and Delete keys into a three-row, two-column layout. This rearrangement also resulted in shifting the arrow keys over to the left, with the left arrow now located just below the right Shift key. While the configuration isn’t detrimental to the touch-typing or gaming experience, it took us some time to adjust to the squeezed layout. The centrally placed and vertically mounted motherboard inside helps to divide the C730 into two compartments, both of which are easily accessible via removable side doors. One panel can be quickly removed via a latch found on the rear, which gives access to the most heat-generating components, like the RAM, processor, and graphics card. Fortunately, neither the RAM or GPU are soldered on, so both are upgradeable in the future. All C730 configurations ship with a single 16GB RAM module, but users can add up to three additional modules for a total of 64GB. There are also three fans in this compartment that are used for active cooling. 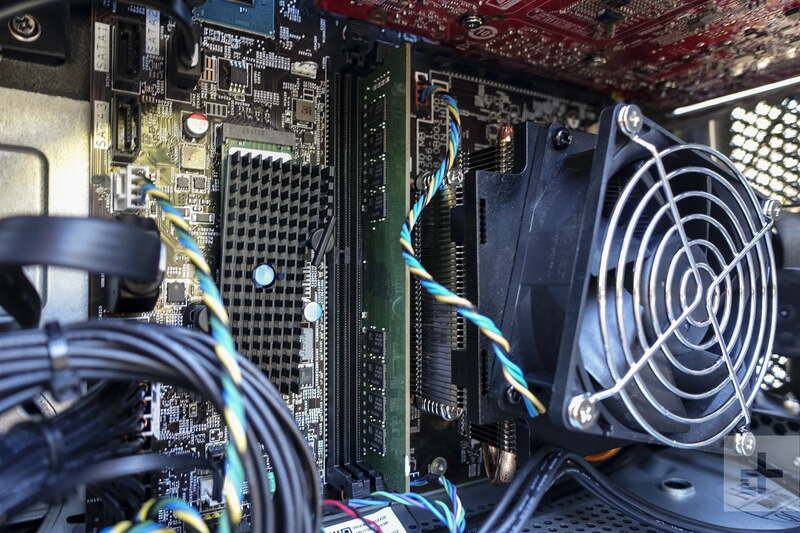 One fan is found on the GPU, a second located on the motherboard, and a third mounted on the rear to pull air from the front of the unit through vents with circular bullet-hole cutouts. In general, we didn’t notice heat to be an issue, even during longer gaming sessions. Fan noise was very subtle, and the low-pitched whirl of the fan blades wasn’t distracting. On the opposite side is a second panel that’s secured by two Phillips screws. Here, you’ll find the drive bay for the HDD along with the internally mounted power supply. Fortunately, unlike the Huracan G21, you won’t be saddled with external power bricks; the only thing that connects the C730 to your home outlet is a medium length power cable. Upgrading the hard drive or adding an additional drive is easy, and Lenovo provides helpful videos for you to navigate the C730’s internals. All the components are well organized, with cables tied together to keep a tidy appearance. There are only two configuration options for the C730. The C730 isn’t built for high-end gamers who demand customizations at every step, and Lenovo is targeting gamers who need a quick entry into discrete graphics or VR capabilities without having to invest the effort into building their own rigs. All configurations come with a six-core, Intel’s 8th-Generation processor and discrete graphics. The entry-level $1,300 option comes with AMD RX570 graphics and a standard Intel Core i7-8700 CPU, while our upgraded review unit comes with an overclockable Intel Core i7-8700K silicon and Nvidia GeForce RTX 1060 graphics with 6GB video RAM for $1,519. Even though Intel’s 9th-Generation processors are incoming, this 8th-gen CPU is still a powerful piece of silicon that delivers ample performance. The overclockable processor comes with a base speed of 3.70GHz that can go up to 4.70GHz with Turbo Boost. Despite coming with the same overclockable processor as this year’s Falcon Northwest Tiki, the C730’s processing performance out of the box is more similar to the base Core i7-7800 processor. In our Geekbench test, the C730 generated a single-core score of 5,331 — compared to the 6,228 score on the Falcon — and its multi-score of 21,830 falls short of the Falcon’s 28,413 mark. Even though the C730 couldn’t quite keep up with the Falcon, its single-core and multi-core scores were better than the Velocity Micro M60, which is powered by AMD’s Ryzen 1800X processor. Given the high-end processors, the differences between benchmarks from the C730, Falcon, and Velocity Micro may not even be perceptible in real-world usage. If you’re looking at buying the C730 primarily as a general computing machine for productivity tasks, these differences may be more relevant. Even then, when working in multiple browsers with multiple opened tabs or editing photos, the C730 kept up well, and we didn’t notice any lags. And proving that benchmarks may not paint a full picture of what a PC is capable, the C730 was able to finish our 4K video encoding test using Handbrake in two minutes and three seconds. That’s close to a full minute faster than the time that it took the Falcon to perform the same task. In our testing, the video file was placed on and encoded to the main SSD, the system’s faster of the two preinstalled drives. To keep costs down, the C730 ships with two drives. There’s a faster SK Hynbix M.2 solid-state drive that comes with limited 128GB storage and a slower 7200RPM Seagate hard drive with a 1TB capacity. Users will want to install applications on the SSD and store larger files on the HDD. Serious gamers will likely want to upgrade the HDD to a secondary SSD. In our CrystalDisk Mark test, speeds of both drives were slower than competing systems. Comparing the 128GB SSD on the C730 to the Falcon’s 2TB SSD, the latter system posted faster read speeds and write speeds. The C730 averaged 1,607 MB/s (megabytes per second) on the sequential read tests and a slow 363 MB/s on the sequential write tests, compared to the Falcon’s scores of 2,687 and 1,504 scores, respectively. And as expected with hard drives, even ones with faster 7200RPMs, you’ll find much slower sequential read and write speeds. The secondary drive on the C730 posted average sequential read and write scores around 200 MB/s. Our review unit ships with Nvidia’s GeForce GTX 1060, and unlike competing systems, there isn’t an option to choose an upgraded configuration with better graphics. The Asus Huracan G21 tops out with an a GTX 1080 GPU, while the Falcon Northwest Tiki goes even further with 1080 Ti graphics. The base C730 ships with an AMD RX 570 discrete graphics card. In general, unless you’re pushing intensive games with high graphics settings, the GTX 1060 chipset does a good job keeping up. Given that Oculus requires a minimum of GTX 960 graphics or better for virtual reality experiences with Rift, performance of the C730 is generally great. We benchmarked the C730 using VRMark’s suite of tests, and the unit’s scores sit between the Oculus required minimum and a premium high-end PC. The C730’s score of 6,628 on the Orange Room test compares favorably against the Oculus minimum of 3,716, but still falls short of the 10,390 high from premium high-end systems. Similarly, the C730’s Cyan Room score of 3,566 sits between the 2,152 requirement at the baseline and 8,548 at the high end. Given the VR benchmark results, gaming results were similar, and though the GTX performed well, its performance fell short of more powerful units, like the Falcon with its GTX 1080 Ti graphics, and the results were consistent across our suite of game tests. At 4K resolution, Civilization VI played with 59 frames per second under medium settings, but performance quickly dropped to 38 FPS when Ultra settings were enabled. The Falcon, in comparison, had a less dramatic drop, earning scores of 106 and 81, respectively. With Deus Ex: Mankind Divided, scores generated by the C730 were less than half of what the Falcon is capable of. The C730’s benchmarked performance with these games were consistent with Dell’s Inspiron 5680, an entry-level gaming desktop with similar GTX 1060 graphics. The situation improves for the C730 when playing the somewhat older Battlefield 1. With older games, the disparity between the C730’s 1060 GPU and the Falcon’s 1080 Ti GPU isn’t as pronounced at lower 1080p resolutions. For example, with medium settings, the C730 got 114 FPS (frames per second), compared to the Falcon’s 198. The disparity grows quickly again once you play the game with ultra-high details or increase the resolution. For instance, under 1440p resolution with ultra-high settings, the C730 scored 61 FPS, while the Falcon scored 143 FPS. When compared to higher-end gaming PCs, like the Falcon with its GTX 1080 Ti graphics, the C730’s GPU begins to show its weakness when you push for higher game settings and increase the resolution. As we saw on our Deus Ex and Civilization VI tests, at lower settings on 1080p, the C730 was able to push close to 60 FPS, but framerates quickly dropped beyond that. When the settings were increased to ultra-high at 1440p, the C730 got about 30 FPS. Gamers who want to play with resolutions higher than 1080p and with faster framerates will likely want to find a system with a better graphics card. The limitations in the GTX 1060’s performance were also apparent on Fortnite. Though the game performed well on the C730 with no noticeable lags or stutters, when the settings were pushed to the game’s ultra-high “Epic” mode, framerates quickly dropped. On our 4K display, the average framerate was just shy of 30 FPS. In 1080p under the same settings, the game performed much smoother, averaging 112 FPS. With 1440p, performance averaged 49 FPS. While the game was still more than playable with 4K resolution and rich details, those with discerning eyes who want faster framerates at high resolutions will want to find a better graphics option than what ships on the C730. Though there’s relatively minimal bloatware on the device, one potential explanation for the C730’s weaker processing score is that it comes preloaded with a trial edition of McAfee, which consumes some system resources while it’s running in the background. Even if you don’t mind the slightly diminished CPU performance, the software quickly gets annoying when it nags you to subscribe. 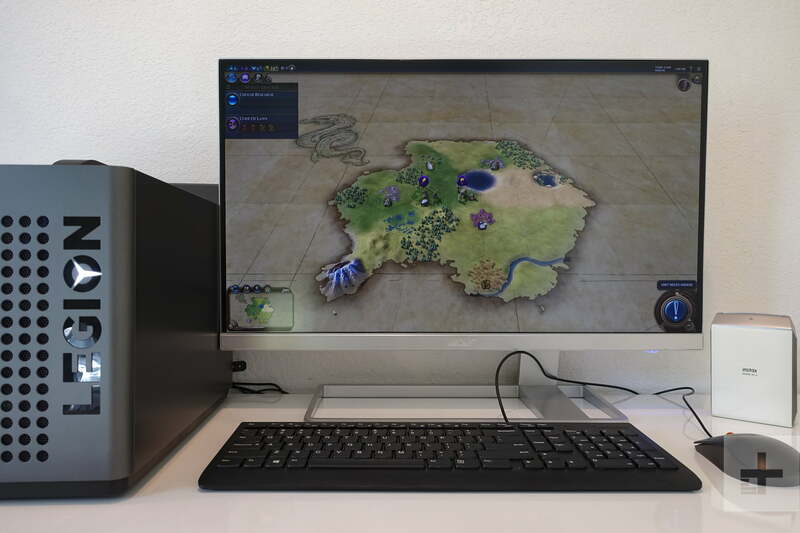 The Legion C730 might be sold as a gaming PC first, but it’s got the looks and the performance to back it up if you need a well-rounded, all-purpose desktop during the day. The high-end 8th-gen, six-core, overclockable CPU gives it plenty of performance to handle productivity and general computing tasks, and the GTX 1060 makes it a suitable gaming rig if you’re not pushing the boundaries with detail-rich games at ultra-high resolutions. 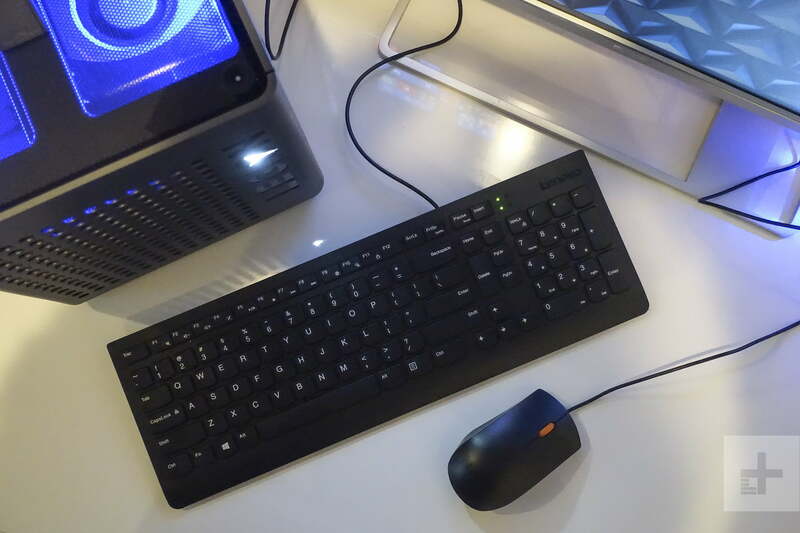 In the compact gaming desktop space, there are a number of options from ASUS, MSI, Falcon, Alienware, and others, but none come with the convenience of a carry handle that gives the C730 a unique take on desktop portability. High-end gamers will likely want to custom build their own rigs, but if you’re more of a casual enthusiast, you can get away with one of these performance-packed rigs. The ASUS Huracan G21, for example, delivers more gaming performance with its GTX 1080 graphics card, but you’ll be paying close to $1,000 more on Amazon currently. One of our favorites at Digital Trends, the Falcon Northwest Tiki, similarly comes with a near-$1,000 premium for its upgraded performance, and higher end configurations will cost you even more. The C730 strikes a good balance between performance and price for casual gamers who may need the high-end processor performance for computing tasks, but who aren’t demanding top-specs in the graphics department. Lenovo includes a standard one-year manufacturer warranty with the C730. This is fairly commonplace, but it also means that this Legion desktop doesn’t quite have the shelf-life that the Falcon commands with its three-year warranty should anything go wrong. The part most likely to fail on many computers is the hard drive, and thankfully, on the C730, that’s user-serviceable and replaceable. What really holds the C730 back is the lack of more modern ports, like USB-C and Thunderbolt 3, that would make the system more futureproof. Adding a Thunderbolt 3 port, for example, would allow gamers to connect a newer Nvidia RTX series graphics card to an eGPU rig. This would provide an instant upgrade to the system, allowing it to grow should your gaming needs change in a year or two. Though RTX cards are new, and ray tracing isn’t a proven technology yet in the gaming space, lacking the Thunderbolt 3 means you’ll likely need to buy a new system if you want to venture into Nvidia’s vision for the future of gaming. The C730 is a capable gaming system that’s ultimately limited by its own graphics card. While the GTX 1060 does an admirable job, it starts falling short when you’re pushing the limits, and that’s a compromise that high-end gamers aren’t willing to make. Entry-level gamers looking for a good starter system who may not care for the C730’s portability factor can find similar performance for almost half the cost in Dell’s Inspiron 5680.